From the moment you got a positive on your pregnancy confirmation test, you’ve been dying to tell anyone and everyone that you’re going to have a baby! However, you choose to wait for the right time to break the news to your loved ones in the right way. 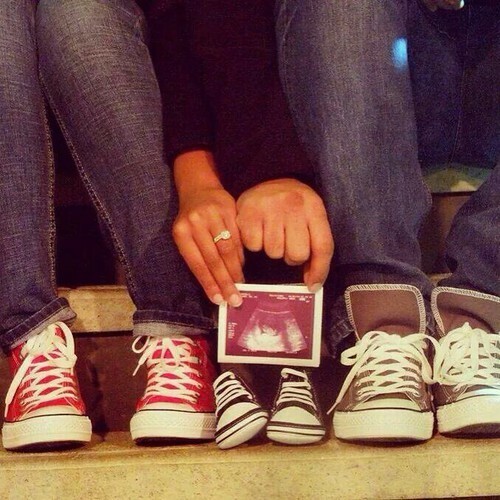 While you’re at it, why not make your pregnancy announcement a little more fun and exciting? Be creative, do something quirky, cool or keep it simple, but make sure that you record the reaction of your loved ones. Here are a few ideas on how you could reveal your pregnancy to the whole world, that’ll spark wonderful memories for years to come. 1. Line up the kicks! Line up a pair of baby shoes along with the other members of the family (dad, mom and baby), take a pic and share the joy along with the approximate duedate! Don’t forget to get creative, give it a personal touch, say a sporty themed shoot or an all formal look. While most mums-to-be find out about their pregnancy by a home pregnancy test, using the same pregnancy kit to reveal the surprise would be simply brilliant. A simple ‘I got something for you’ surprise for close family and friends would get the craziest of reactions. If this is your second pregnancy, you certainly should rope in your cute little first born who’s about to be the older sibling to make the announcement. Not all kids react the same way, some can’t wait to have a little brother or sister, and others are heartbroken on learning that they’re not going to enjoy all the attention any more. No matter how they react, it’s a priceless memory to capture and share. A picture speaks a thousand words. And, you should let this adorably dotted one do the talking. Get a great print out, stick it in a frame and gift the same to your close family and friends. Or you could even have the mum-to-be hold the snap against her tummy as the proud dad-to-be holds her tight to let the world know about the latest addition to the family! 5. Strike a pose with your new name! Make a mark your new status as soon-to-be-parents with matching couple tees that read “Mum” and “Dad”. Not only are they cute, but they can be re-used for various occasions throughout your pregnancy - from fun family photos, to baby showers to the day of the delivery. From all the ideas listed here, which one do you plan to incorporate for your special day? Are there any fun ideas that you can think of for announcing the baby’s arrival? Do tell us and let us know of any queries you might be having. We’d love to help!